Sepia tone photograph showing the off side of chestnut colt, Duke of York wearing saddle number one, H. Short up. 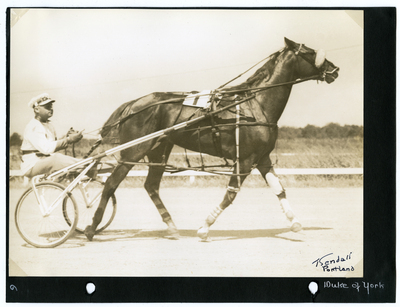 The Duke of York placed second in all three heats of the Foals of 1936 National Stake at the Saturday, July 15, 1939 Grand Circuit Meet at the 1 mile kite track in Old Orchard Beach, Maine. The photograph is signed in the lower right corner by Guy Kendall.